Almonds are a delicious snack and nutritional powerhouses, to boot. You’ll see them sold in a number of different ways -- roasted, smoked, blanched, slivered, and sliced, to name a few -- and like many other food products, it can be difficult to decipher all the designations industries use on their labels. “Natural” is the term commonly used in the industry for shelled almonds that still have their skins on. These are generally the almonds for eating out of hand, and for consumers’ purposes, they are considered “raw” in that they have not been blanched, a brief heating process which removes the skins, or roasted, which means essentially almonds cooked with dry heat or in oil. You won’t often find the designation of “raw” used to label almonds in the marketplace, at least since 2007, when the USDA, on the recommendation of the Almond Board of California, passed the mandatory almond pasteurization program in response to two cases of salmonellosis linked to almonds several years earlier. 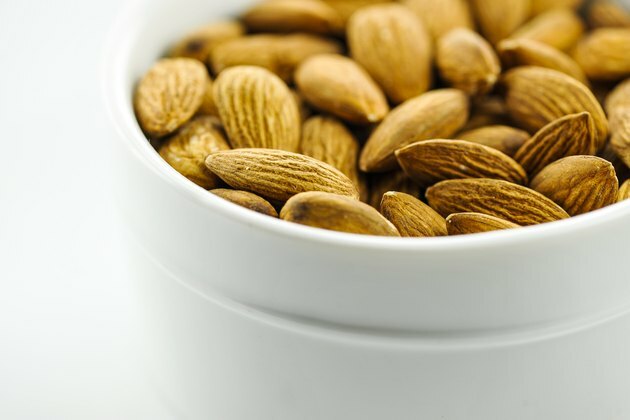 Any almonds that you do find designated as “raw” have undergone steam pasteurization or have been chemically treated with propylene oxide, another form of pasteurization. The versatile almond shows up in different cuisines and can be used in savory dishes and desserts with equal panache. Try using natural sliced almonds in salads; sauteed in butter until lightly browned and used as a topping for cooked fish or vegetables such as green beans or asparagus; chop or grind natural almonds for streusel toppings, pie crusts, fruit tarts, or cakes, or simply eat them out of hand --their fat and protein make them a healthy and satisfying choice for a snack. A 1-ounce serving -- about 23 whole nuts -- supplies approximately one-third of the daily required value of vitamin E. Almonds are also an important source of magnesium, protein, fiber, potassium, calcium, phosphorus, iron, and copper. They are also naturally cholesterol-free, and of the 14 grams of total fat found in one serving, 13 grams are unsaturated. Among all consumed nuts, almonds have the highest percentage of monounsaturated fat. This favorable fat profile is linked to healthy cholesterol levels.